One of the reasons Tony and Brendan decided to open the Greene House Inn was the fact that there are so many things to do. 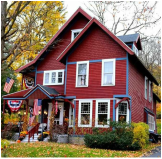 We've compiled a list of activities that would make the Greene House Inn a great place to stay and make your home base for your day-trip vacation in any season. As we continue to discover more and more great places to go, we'll be sure to add them here. We decided to put these attractions in both categories below, by location and by activity.